Making this place home means putting paws to the dirt. 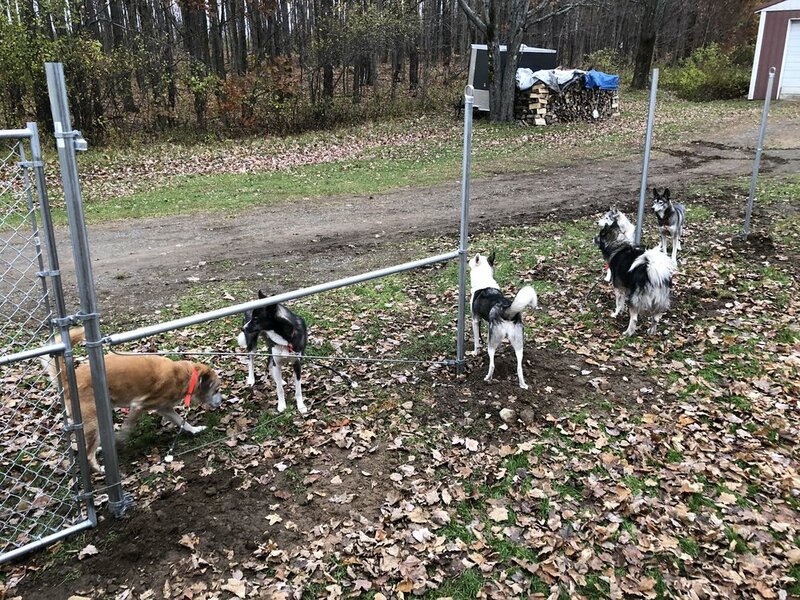 Due to some missing parts, the dog yard fence construction has been temporarily halted. I brought the pack up here expecting only a day of tie outs and rotations, but now we won’t have a secure yard for a couple more days. The dogs have been handling the situation like champs (aside from a few confused indoor poops and pees). 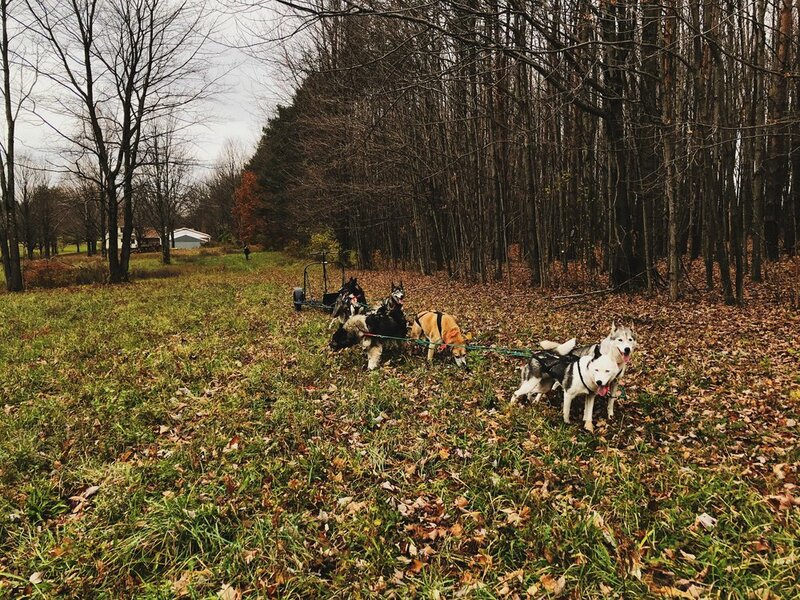 To make up for the lack of outdoor space to play untethered, we’ve begun exploring the property via dog cart. For our first trip, I even had Dexter on the line for a brief trot around the perimeter “trail”. We’re forging a path by following the long driveway, running along the tree line near the road, and cutting back to the opposite side of the property. From there, we’ve been experimenting with cutting back across the front yard to the driveway, or by running along the edge of an overgrown meadow and turning towards the backyard. 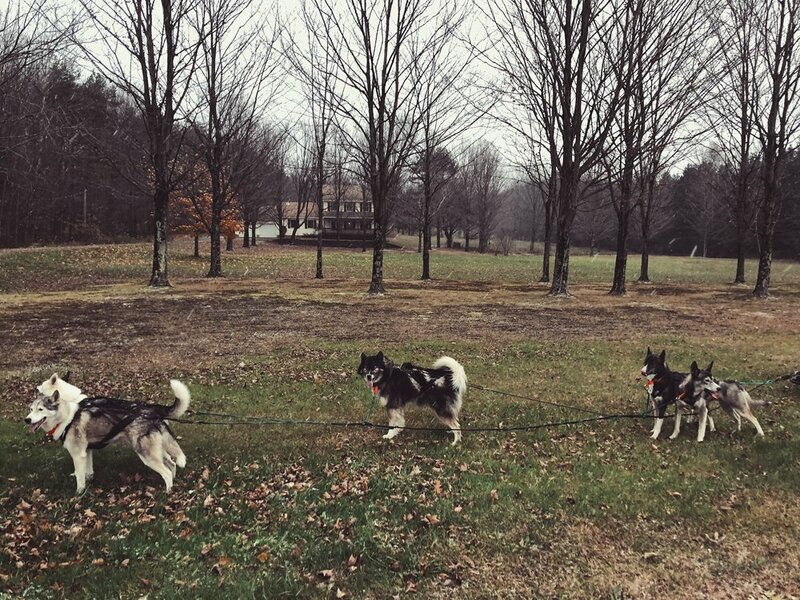 Once behind the house, we loop around the back portion of the non-wooded property. One side has a fairly obvious path flattened by tires, the other side has some gentle rolling hills that the dogs like to bomb up and down. I’ve been taking the team out twice a day to get them used to the space. 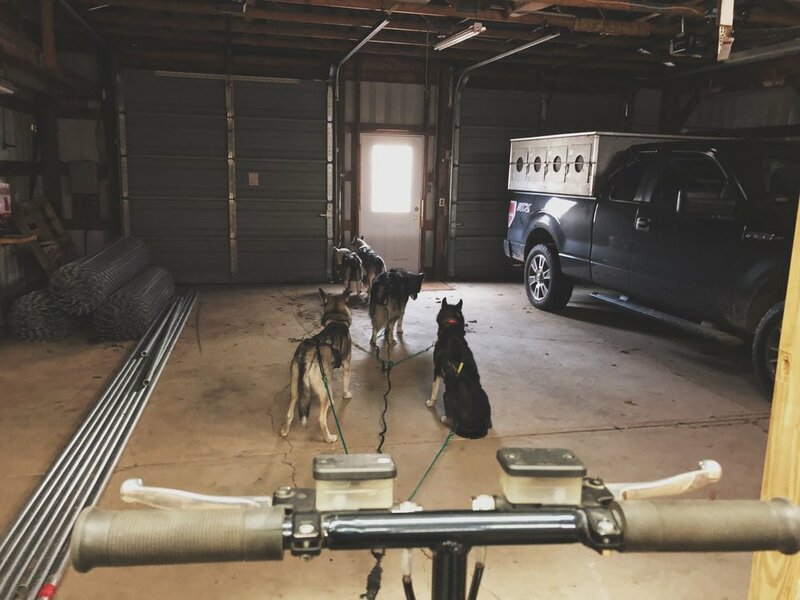 We’ve been hooking up inside the pole barn, so they’re getting familiar with a new routine. Add a bit of snow to the equation and they’re instantly more fired up. Denali is eager to keep exploring. We were doing four mile runs when we left New Jersey, so running a mile or two at a time feels like a tease. I get it. I want to run more miles, too. Normally by November we’re running more than five miles at a time. I’m aiming to be at 25 to 30 miles by the end of this season. It feels like a lofty goal. Our first attempt to extend runs into the woods beyond resulted in tangles and cart jams between trees. I had a vague idea of where I was going from hiking through a few weeks ago, but it was clear I needed to walk the trail again. My parents came up to see the house (and help with floor renovations), so we all went for a walk through the back trails. There’s a fairly obvious and clear trail that leads down the steep slope into the wooded portion of my land—I just hadn’t looked to the left of my property yet. Once at the bottom, there’s a gorgeous trail alongside a stream. We cleared some branches and fallen trees, solidifying a trail that dips down into the woods, cuts through my neighbor’s 120 acres, and then comes back up to meet with the road. From there, we turn right and follow the grass embankment back to the house. 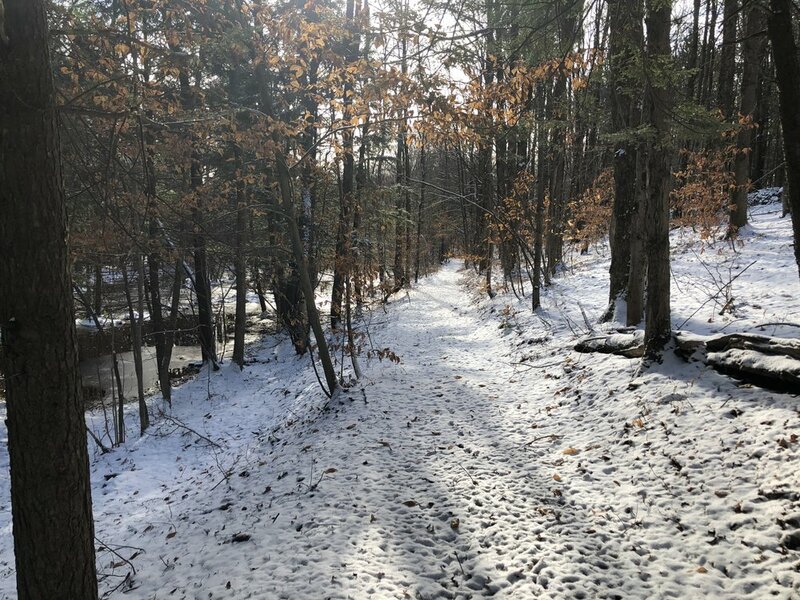 There are other trails in the woods, and at least one is a snowmobile/ATV trail that connects to state lands. There’s also plenty of room for me to create new trails, I just need the right tools for the job (it’ll most likely be a project for next spring). For now, I’ll keep clearing the existing trails and getting used to the landscape so we’ll know our way home.